The history of Bangladesh as a nation state began in 1971. In the past time politics was used for the welfare of country. In those day’s there was no quarrel among the politicians for money and power but as today most of the politicians are interest is grown for money and power not for welfare of country. Hartal is used for political approach. 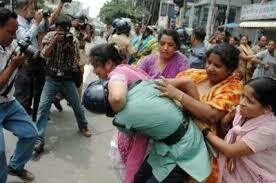 Hartal was not everyday matter in those days but at present time Bangladesh’s political system is feeble. For this purpose opposite party called hartal frequently. inconvenience or a nuisance as deemed by some people. It is tantamount to a call for an “economic boycott” of our own goods and services by our own politicians during the period hartals are in effect. In stronger words, one may regard the calls for hartals as an act of constitutionally sanctioned economic terrorism. Historically, calls for hartals in Bangladesh are made by major political parties when they lose their grip on positions of power. Obviously, not all politicians are corrupt. Unfortunately, the honest and the dedicated are few and far between. Once an opportunity opens up with offering of a new government contract, or some private entrepreneur taking an initiative for major investment, the ministers and the entire government machinery including the lending bank officials line up to get a share of what can be grabbed from the project. Hartal politics has become pervasive in Bangladesh. I t has part of our life. The frequent hartals and work stoppages have been view from different angles. Though hartal is the opposition political parties insist on a powerful tool of pressure to make their demands. Frequently hartals generally disrupt the normal life. Moreover, the poor suffers more during the hartal as they lose their income. It is generally believed that frequent hartal not only disrupt normal life, they also have a negative effect on the poor income earners of the city like the rickshaw pullers, day labor, slum dwellers etc. Especially day laborers and lower socio-economic people were perceived to be worst affected by hartal. Day laborers are very poor that they live on hand to mouth. During the hartal, they can’t go their work. So they don’t earn money. For this purpose, hartal hampered their economical income. If they don’t income money, they are hungry everyday. Both major political parties have the financial resources and the country wide organization needed to employ outside workers. Both can afford to hire tokais, armed cedres or poor slum dwellers to ensure a good turnout at their programes. This day laborers are worked for economic interest and sometimes they are victim of this politics. The consequences of hartal in terms of economic, social and political costs are huge. While the negative economic consequences of hartal draw a great deal of attention, its social consequences should not be overlooked. Over a period of 52 years from 1947, about 250 deaths during hartals could be identified from newspaper reports. Over 13000 people were injured and 10000 arrested and most often it is the poor who are victims of these conflicts. Hartal is a form of protest against the authorities to realize certain demands or to demonstrate disapproval of certain actions of those against whom the hartal is directed. Political hartal is different in nature and takes place on political issues that certain the whole nation and raise public conscience for or against the demands at issue. The only way to resolve political hartals is to reach understanding and argument through dialogue and negotiation between the government in power and the opposition to resolve the issues that sparked off the hartals. After the independence of the country and the emergence of Bangladesh the context has changed and the protection and promotion of the national interest have become the supreme concern for each and every citizen and more so for all political parties and the leaders in a constitutional and democratic system. However, in an autocratic and undemocratic regime where the government is not formed through the constitutional process by a fare and free election, hartal is recognized as a legitimate instrument to demonstrate people’s protest against and disapproval of an democratic government (Source-www.cyberbangladesh.org/ethics.html). Top business leaders may propose a law banning hartal to put on end to its detrimental effects on trade, business and other economic activities. Hartal is not simply an inconvience and naisance, it is tantamount to call for an “economic boycott” of our own goods and services by own politicians during the period hartals are effect. In stronger words, one may regard the calls for hartals as an act of constitutionally sanctioned economic terrorism. Reluctant shopkeepers and innocent by standers lose properties and many even get killed by hartal enforcing hoolingan. Hartal causes financial loss of thousand of crores of taka but harm abroad is more than the economic loss at home. The economist said hartal hurts credibility of the country in terms of source of export and access to international market. Hartal is affected the life of the people in Dhaka city. People are social beings and hartal affects individual as well as society as a whole. Disruption in mobility and financial loss in terms of increase in expenditures and decrease in income are perceived to be the major effect of hartal on personal life. Especially hartal affects our day labor’s personal life because during the period they don’t go outside and they don’t earn money. So they are more affected on hartal. For these perspectives, I can say that my topic is perfect to be studied in the present context of hartal. Hartal is a term in many Indian language for strive action, used often during the Indian Independence movement. It is mass protest often involving shut down of workplaces, offices, shops, courts of law as a form of civil disobedience. It is mode of appeal in to the sympathies of a government to change an unpopular on unacceptable decision. Hartal was originally a Gujrati expression signifying the closing down of shops and warehouses with the objectives of realizing a demand. In Pakistan and Bangladesh, a hartal is a recognized political method for articulating any political damand. A day labor is he who does heavy manual labor in various fields. He works hard from dawn to dusk for his employer and gets his wages at evening. Sometimes he and his family go without food if he can’t nanage work. The life of a day laborer is full of sorrows and sufferings. He can hardly enjoy peace and happiness. In all weathers good and bad ha works hard all day long and earns his livelihood by the sweat of his brow. Through the service of a day laborer is of great importance. He is very much neglected. He is not hold in due respect. The continuing use of hartal in India, Nepal and Bangladesh underscores that in the midst of transition to democracy experience many difficulties, obstacles and reversals. The process is inevitably intertwined with the broader process of modernization, which gives rise to a variety of contradictory social and political forces. It is difficult to recognized that the pervasiveness of hartal in a country like Bangladesh is an obstacle to democracy and that their persistence is related to the way political mobilization takes place and political demands are articulated. The mass people are affected very much in hartal. They can’t go to their work and can’t earn money. Sometimes they are facing some urgent problem but they can’t go outside. If they go outside, they are victim of hartal. During the period of hartal, the product can’t come in town, for this purpose,market prize of products is increased. During the hartal period mass people are sufferer. Hartals affect all section of society. Some of the main impacts cited were: disruption to mobility, financial losses, hampering of business activities. Other key impacte were the closing down of educational institution, damage to vehicles and building, suffering of the general public and prize hikes of daily essential were cited as additional effects. Hartal is not simply an incontinence and a naissance, it is tantamount to call for an “economic boycott” of our own goods and services by our own politicians during the period of hartals are in effect. The impact of hartal on the economy was very or some what negative. The most harmful impacts on the economy were losses to the business sector and harm to the national economy. Disruption of transportation and exports and imports were also significance among the adverse effect. A huge amount of liquidity remained stored at every branch of commercial bank, posting high risks in operating banking activities during hartal. The analysis of the UNDP data on hartals show that between 1947 and 2002 an estimated 1,172 hartals were observed in Bangladesh, while 611 of them took place from 1995 to 2002 since the advent of democracy in the country(Source-www1. chineseshipping.com.cn./en/news). * Regional and local hartal occurs more frequently and last longer than nation-wide hartals. * Both major political parties equally active in using hartal as a means of political protest. In the ten year period from 1991 to 2000, 61 national hartal were called by the BNP,while the Awami League called 67. * There appears to be a ‘bunching’ of hartals associated with a change of regimes. * Recently, there seems to be a trend towards more half-day hartals. Manufacturers and Exporters Association estimated that it loses US$18 million a day during hartals. These estimates may however be slightly exaggerated, given that various coping strategies are used to make up for losses. Source-Own calculation based on BBS data. (Statistical year book 2000) and hartal statistics. The impact of hartal on society reflected strongly. Hartal hampered business and disruptions to everyday life. Especially day laborer and middle lower income people, who are less financially solvent, are most affected by hartals due to loss in income and increase of their expenditures. Students were also affected by hartal. Hartal had a very or somewhat negative impact on education. Hartal prevent student from attending classes, creating increased pressure on them later on their studies and at exam time. The major impact of hartal is the postponement of exams resulting in delays in finishing school session. Hartal delayed education, which can have severe long term effects on younger people’s future prospects. People are social beings and hartal affect individuals as well as society as a whole. Disruption in mobility and financial loss in terms of increase in expenditures and decreases in income are perceived to be the major effect of hartal on personal life. In general people are more conscious about the financial impacts of hartal than their other effects on society such as security concerns or social cost of frequently called hartal. Source-A survey on the impact of hartal on the poor of Dhaka city, Dr. Osman Haider Chowdhury,2000. Source-A survey on the impact of hartal the poor of the Dhaka city, Dr.Osman Haider, 2000. Hartals and the concomitant loss of output and the welfare may seem as being a short term phenomena by the hartals callers. Political stability is probably the most important discouraging factors for foreign investment and capital flow.Such destructive activities could send back many potential foreign investigators from our share at a time when many developed countries including Turkey and Japan are looking to relocate their industries in Bangladesh. During hartal time, essential commodities from different district could not reach their distination.As the consequences of hartal,prise of various vegetables,fish and meat items went up slightly in retain markets. Hartal as a means of political activity.The day labor is defined as one who has worked everyday for income and one who earns his livelihood through applying his/her physical labor like-Rickshaw-puller,small vendors on the footpath and slum dwellers who are engaged in varieties of income earning activities on a day-to-day basis without any contractual obligation.The rickshaw pullers, poor footpath vendors,small shopkeepers have been mostly affected in hartal.During the period of hartal, they can’t go their work. For this purpose they can’t earn money.Their income is very limited which is not sufficient to maintain their family and they can’t teach their children properly.